At the end of our season, RTC is having our first ever out-of-town field trip. Nearly 50 of us are heading up to Stratford to see Hamlet. 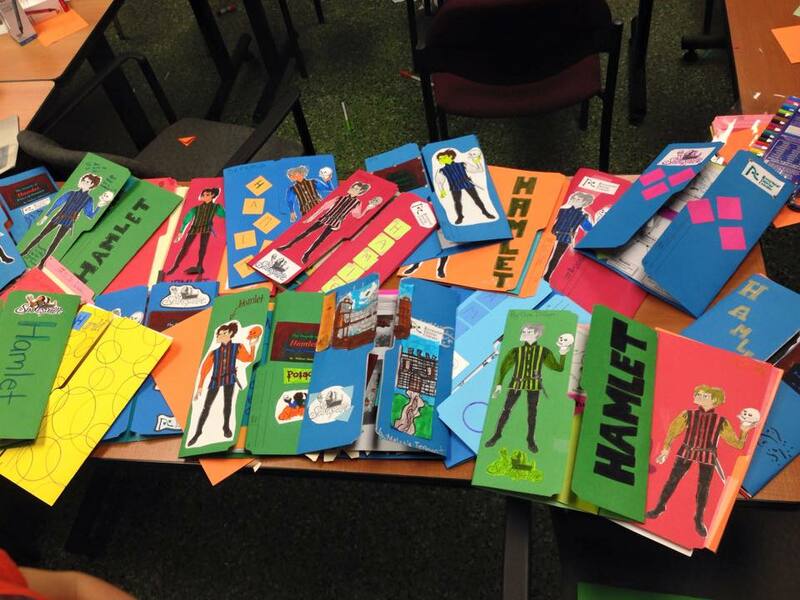 We had a quick overview of Hamlet when we were working on Outrageous Fortune earlier this season, but knowing that we will be seeing it, we wanted to be sure that the students would really appreciate and enjoy the story, and get as much out of it as possible. So – we’re studying Hamlet. We’ve been dealing with Shakespeare’s language, the setting, the plot and themes, the characterisations, the imagery, and now we’re working our way through the play one week at a time, an Act per week. As part of the study experience, we’ve got the kids industriously busy making lapbooks. These are a fun, creative way to consolidate information in an attractive folder, to pick out the important things that you want to hang on to. They’re packed with artwork, vocabulary, timelines, character maps, plot points, themes and symbols, favourite quotes, and so much more. Teaching Shakespeare each week at rehearsal is definitely a highlight for me – I have B.A. in Literature, and I love sharing everything that has come together in one of Shakespeare’s plays. The classes have been remarkably interactive, busy, fun, and really, really loud – busily engaged people with lots to chat about. It’s a really dynamic part of the day. I’ve told them there’s no test, but that’s not strictly true. It’s a test for me – if they come out of the theatre at the end of the show, ready to charge around the building at high speed to intercept the cast for autographs, chattering happily about what a good time they had, then I’ll be pretty sure I did a good job, and that the class was a success. It’s something new we haven’t done before, but man, it’s a good time! Previous: Previous post: Coming Soon to the Olde Walkerville Theatre! Next: Next post: Mask-Making Class!